The public programs at the NH Clay Project work to support our mission to foster an environment that supports the investigation of new ideas and work of ceramic artists. We have various events offered throughout the year that are free and open to the public, such as artist lectures, exhibitions and open studio days. For timely notifications, visit our social media pages on Facebook and Instagram or sign up to receive our newsletters! Blayze Buseth is a current resident artist for New Harmony Clay Project. His intent as an artist is to immerse himself in a community to create artwork based on his surroundings and concepts that he is confronted by during his stay. Join us as Blayze discusses his exploration of new functional content in porcelain from the inspiration of New Harmony. Lecture is free and open to public. 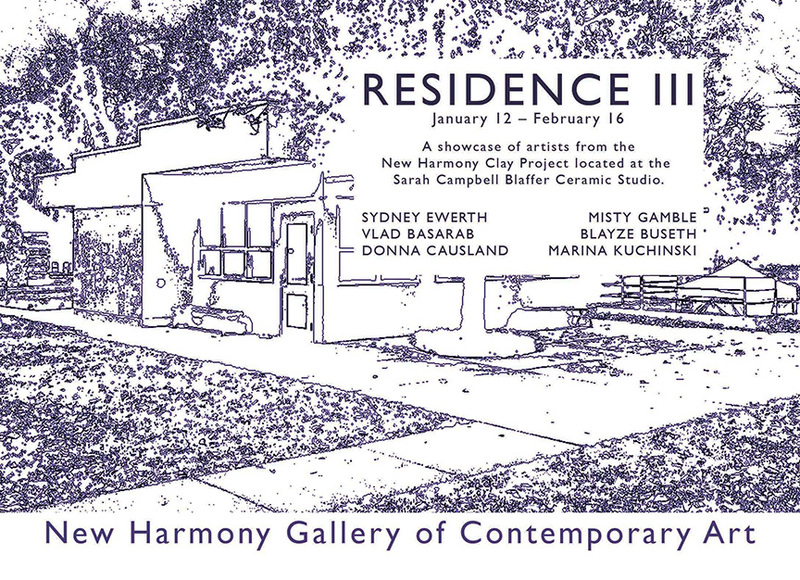 “RESIDENCE III” is the third annual exhibition that showcases the resident artists from the New Harmony Clay Project located at the Sarah Campbell Blaffer Ceramic Studio. This year the exhibition is returning to the New Harmony Gallery of Contemporary Art, January 12-February 16, to include Sydney Ewerth, Vlad Basarab, Donna Causland, Misty Gamble, Blayze Buseth and Marina Kuchinski. Join us as we celebrate and have the chance to meet and greet the artists at the Gallery Opening on January 12, 2019, 4:00-6:00 p.m., CST. 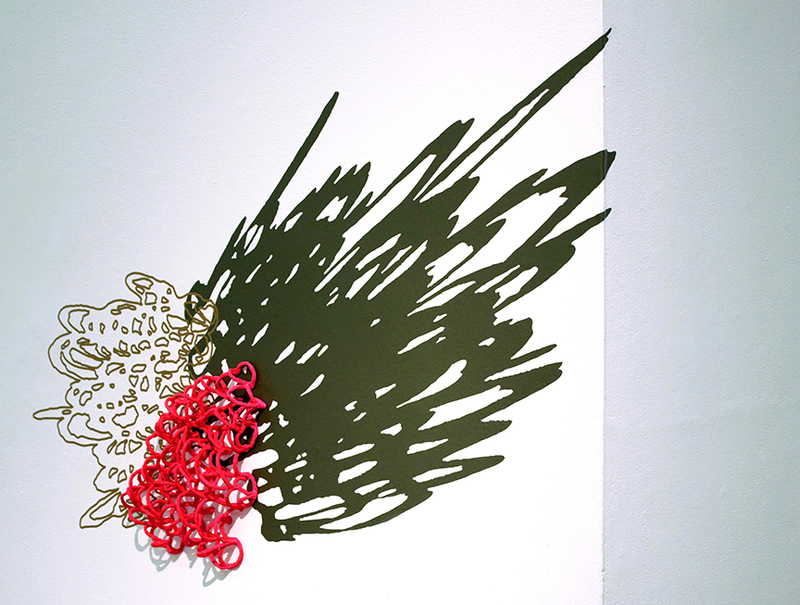 Regular gallery hours are 10:00 a.m.-5:00 p.m. Tuesday through Saturday. 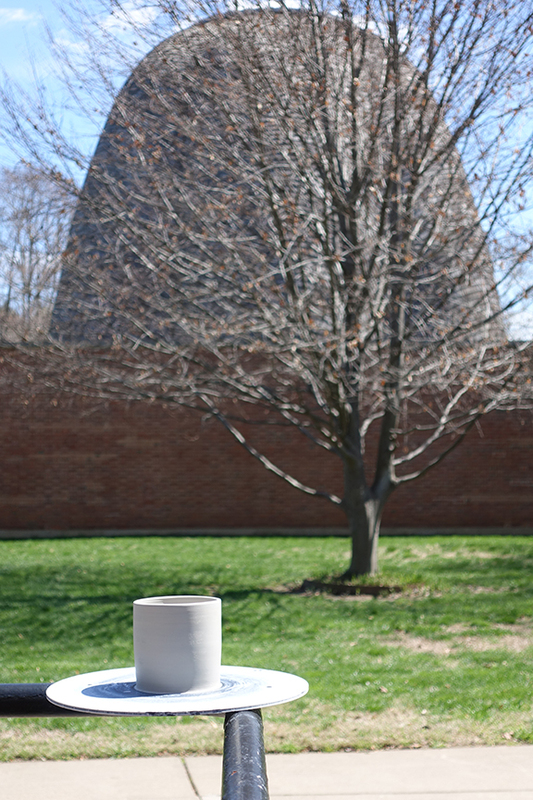 New Harmony Clay Project (NHCP) residency program fosters an environment that supports the investigation of new ideas and work of ceramic artists. It is an organization under the New Harmony Artist Guild, a non-profit 501(c)3, that serves as an incubator for nurturing the arts. NHCP is a rural residency program, supported by the Efroymson Family Fund, Greater Houston Community Foundation, Lenny and Anne Dowhie Trusts, and Robert Lee Blaffer Foundation. Our goal is to encourage emerging and professional visual artists/educators in ceramics by giving them quiet space and the time to develop a new body of work. The New Harmony Gallery of Contemporary Art is an outreach partner of the University of Southern Indiana, and provides a not-for-profit (non-commercial) exhibition space for current Midwestern artists and to promote discourse about and access to contemporary art in the southern Indiana region. The gallery is located at 506 Main Street in New Harmony, Indiana. Regular hours are 10:00 a.m.-5:00 p.m. Tuesday through Saturday and 12:00-4:00 p.m. Sunday. For more information, contact Garry Holstein, director, at 812-682-3156 or go to USI.edu/nhgallery. Join the merry pranksters at the NH Clay Studio for a day of ceramic fun! We will be throwing on the wheel, pinching pots, producing elbow pots, mud splatting and much more! Free and open to all ages! A presentation by Mitzi Davis, NH Clay Project resident artist. Mitzi will speak about her passion for creating functional objects and how she blends her childhood nostalgia into her ceramic artwork. Lecture is hosted by the New Harmony Kiwanis International Club and is free and open to public. Join us as we explore the work of James Lee Webb, our current artist-in-residence. James will speak about his recent body of work in New Harmony, Lexical-gustatory synesthesia as an explorative tool for art making and what the ethos of authenticity means to him through his synesthesia. Join us as we explore the work of Sydney Ewerth, current resident artist for New Harmony Clay Project. Sydney will discuss the significance of the “lived space”– our tangible existence and reality, and the “imagined space”– where memory and its capacity to become distorted over time, exist simultaneously and how clay aesthetically translates a tangible record of who we are. Join us as we explore the work of Vlad Basarab, current resident artist for New Harmony Clay Project. Basarab brings to the attention of the 21st century public the human need to safe guard the past. 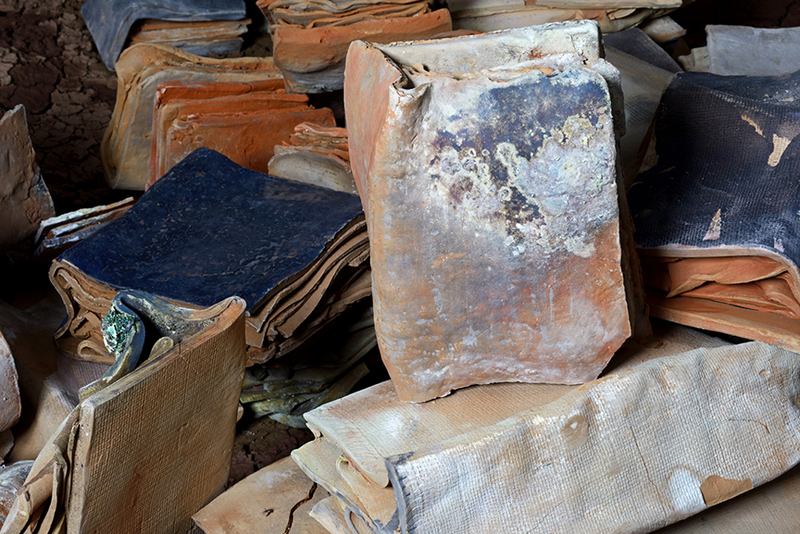 He uses unfired clay to reference the fragility of knowledge and of the human condition, while the fired books become a symbol of permanence, a vehicle for transmitting knowledge. Join us as we explore the work of Donna Causland, current resident artist for New Harmony Clay Project. Donna will discuss her exploration for balanced beauty. Using her vocabulary of sculptural porcelain forms, she will describe exquisite ornamental layering and how she seeks a delicate harmony between functional and decorative.